A UK Mercedes-Benz Sprinter ambulance in Suffolk. An ambulance is a type of vehicle made to carry sick or injured people. Normally, ambulances go to people in emergencies to take people to hospital. Examples of emergencies include serious bleeding and broken bones, chest pain, serious head injuries, trouble breathing, and people injured in situations like car crashes and falls. The first ambulances were military horse-drawn carts which were used to carry badly wounded soldiers to field hospitals after a battle. Horse-drawn ambulances became commonplace in Europe during the era of Industrialization and as hospitals became common. Automobiles replaced horses in the early 1900s. Today all ambulances are vans which are converted into small mobile clinics. They can provide first aid, emergency care, various medicines and life support gear, and carry patients to hospital. Ambulances normally have emergency medical technicians (EMTs) and paramedics who work on them. They are highly trained to provide emergency care and treatment before reaching a hospital. Treating someone with a medical emergency is called first aid. They carry a lot of special equipment that can keep people alive. 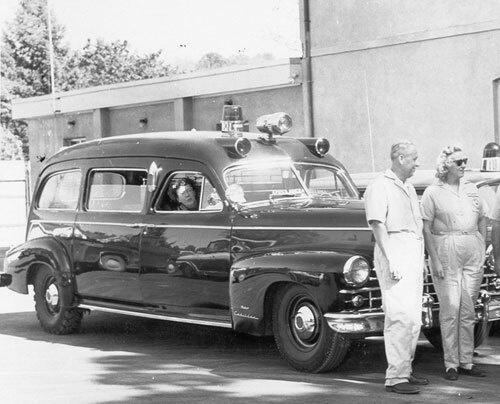 The ambulance carries lots of first aid supplies for bleeding, broken bones, car crashes, burns, heart and breathing problems and lots of other medical emergencies. They also carry advanced tools for delivering babies in an emergency and restarting a heart. Ambulances are normally called by dialing a special emergency number, which is different from country to country. In the UK, this number is 999; USA 911; Europe 112. Ambulances are sent out by emergency medical dispatchers. Air ambulances have been important for the last twenty years, with quick, or out-of-town medical support becoming a necessity. Both helicopters and jets are generally outfitted with the same kind equipment that you see in a typical ground ambulance. In the United States, the Coast Guard runs a public air ambulance service using helicopters. 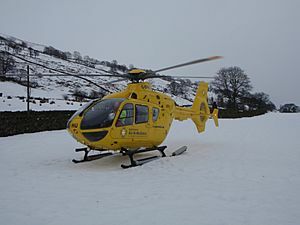 There are also privately owned air ambulance services that provide for a wider range of needs, including international transport. Air ambulances are especially important in countries which are sparsely populated (= there are very few people living in a vast area), such as Canada, Russia, midwest USA, Sweden or Finland. They can often save a life of a patient who would otherwise die because he could not be carried fast enough to hospital by other means. Ambulance Facts for Kids. Kiddle Encyclopedia.